Many organizations impact the design, operation, efficiency and installation of space conditioning equipment and requirements. Most notable is the American Society of Heating, Refrigerating and Air-Conditioning Engineers (ASHRAE, pronounced ash-ray). Founded in 1894, ASHRAE’s mission is to advance the art and science of heating, ventilation, air conditioning and refrigeration to serve humanity and promote a sustainable world. Headquartered in Atlanta, GA, ASHRAE is an international organization of about 50,000 members. Membership is open to any person associated with the field including indoor air quality, building design and operation, and environmental control for food processing and industry. ASHRAE fulfills its mission through research, standards writing, publishing and continuing education. The organization accomplishes this mission via councils that are responsible for three major areas of activity. The Regions Council is responsible for a variety of activities including membership, resources, chapter activities and technology transfer, and student activities. The Technology Council oversees research, standards, technical activities, environmental health, and refrigeration. The Communications/Education Council handles all forms of communications, including the monthly ASHRAE Journal and the ASHRAE handbook, which is written to help engineers with the design and operation of HVAC equipment, as well as the ASHRAE Learning Institute and ASHRAE programs. 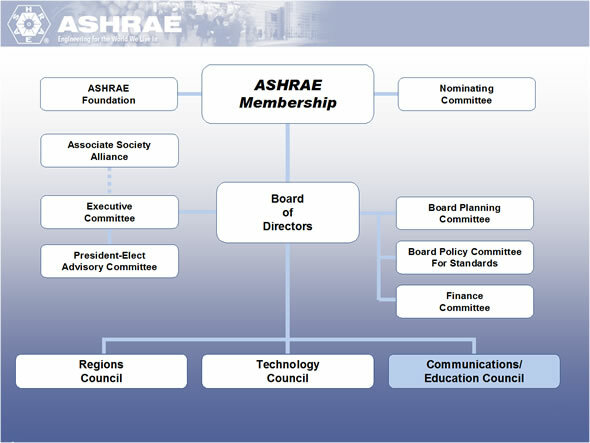 Participation in ASHRAE is available locally through chapters and through membership on committees under the direction of the three councils. Other independent and governmental organizations which affect the science and business of space conditioning include the American National Standards Institute (ANSI), the American Society for Testing and Materials (ASTM), the Canadian Standards Association (CSA), Underwriters Laboratory (UL), and the Gas Appliance Manufacturers Association (GAMA). The American National Standards Institute (ANSI) oversees and accredits the organizations, such as ASTM (formerly American Society for Testing and Materials), who formulate the standards by which appliances are tested. ANSI’s goal is to insure openness, balance, consensus and due process in the testing procedures that standards development organizations put forth. It accomplishes this by entertaining discussion and appeals and gaining consensus among all interested parties that a proposed standard was developed in accordance with ANSI guidelines. Satisfactory completion of this process earns American National Standard approval and status for the standards developing organization’s testing procedure. ASTM is one of about 200 standards development organizations (SDOs) accredited in the U.S. by ANSI. It is also one of the largest SDOs in an arena where 20 companies produce 90% of the standards. Membership in ASTM permits interested parties an opportunity to sit on ASTM’s standard setting committees. Currently, ASTM provides standards for various types of heating equipment. For a brief history and more information about ANSI and ASTM, go to the Food Service module or visit their websites at www.ansi.org or www.astm.org. Underwriters Laboratory (UL) is another independent, not-for-profit testing facility and perhaps one of the most well known of its kind. UL also tests and certifies products for safety and efficiency in line with DOE requirements. GAMA began in 1918 as the manufacturer’s arm of the American Gas Association. In 1935, the group formed as a separate, incorporated association under the name Association of Gas Appliance and Equipment Manufacturers. Over the next 70 years, the association evolved and changed its name to its present-day GAMA (Gas Appliance Manufacturers Association) acronym and merged with the Institute of Cooking and Heating Appliance Manufacturers and The Hydronics Institute. Today, GAMA represents more than 200 worldwide manufacturing companies of gas-fired, oil-fired and electric space and water heating equipment, components and related products for residential, commercial and industrial applications. GAMA members account for more than 90% of all shipments of these products in the U.S. alone. GAMA supports the development of codes and standards that ensure that products operate in the safest possible manner by participating actively in the activities of code groups and standards developing organizations. GAMA also verifies product energy efficiency performance through its Efficiency Certification Program. Satisfactory completion of GAMA’s independent testing through Intertek laboratories entitles the manufacturer to display the GAMA Certification symbol. ETL SEMKO, a division of Intertek Group, specializes in electrical product safety and performance testing and electromagnetic compatibility (EMC) testing. ETL Semko will also test all appliances, subject to DOE’s minimum energy efficiency requirements as well as testing to Energy Star requirements. For more information about CSA, UL and ETL Semko, go to the Food Service Module. Information about the regulations governing heating, ventilation and air conditioning equipment can be found at the Department of Energy (DOE) at www.energy.gov and Environmental Protection Agency (EPA) www.epa.gov websites, including information about the Energy Star efficiency program at www.energystar.gov.